I can’t remember my first Scotch egg or even why I decided to try one, but after the first bite I was hooked. How could I not fall in love a perfectly boiled egg wrapped up in a sausage coat? 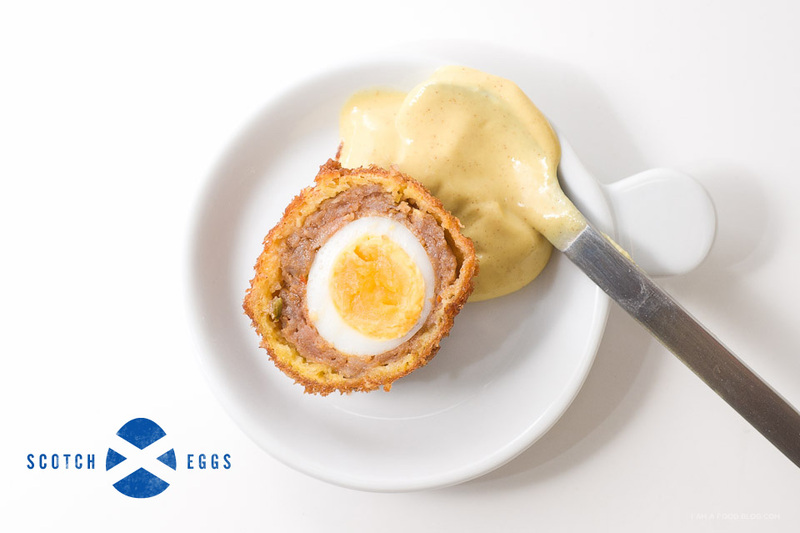 A Scotch egg is all good things about breakfast rolled up into one awesomely hand holdable ball. My love for Scotch eggs is even further fuelled by the fact that they are traditional British picnic food. They were invented in 1738 by London department store Fortnum & Mason as a portable snack for long carriage rides. I don’t regularly go on carriage rides (read: never), but I’m always down for a portable snack. Even better when portable snacks are minified using quail eggs. 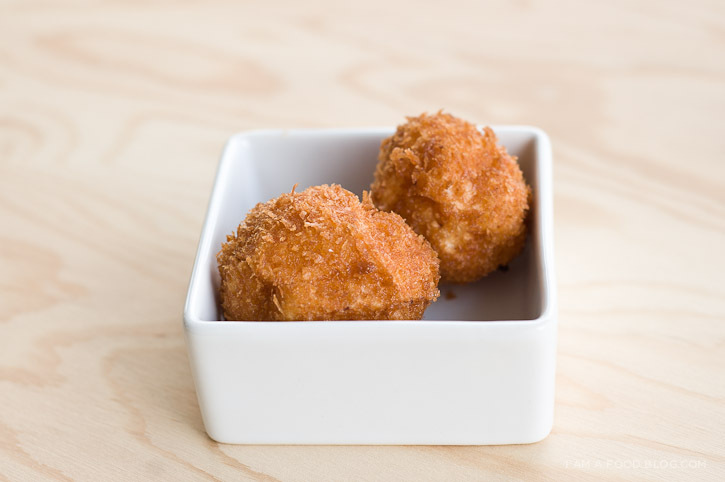 Crispy, meaty and eggy, these two-bite Scotch eggs were perfect with a smear of Dijon mustard. We’ve had a string of sunny days and if the weather holds this weekend is going to be perfect for an Easter egg hunt and picnic. I’m definitely going to be packing up some Scotch eggs along for the ride. If I had to choose, I don’t know which would be better: finding a dark chocolate foil-wrapped egg or a delectably savoury tinfoil wrapped Scotch egg. It’s a good thing my egg hunt will involve both! i am egg-centered, i am sausage-wrapped: i am mini scotch quail egg! Fill a pot two-thirds full of water and bring to a gentle boil. Gently add the quail eggs (don’t crowd the pot) and continue to boil for 4-5 minutes for hard boiled eggs. 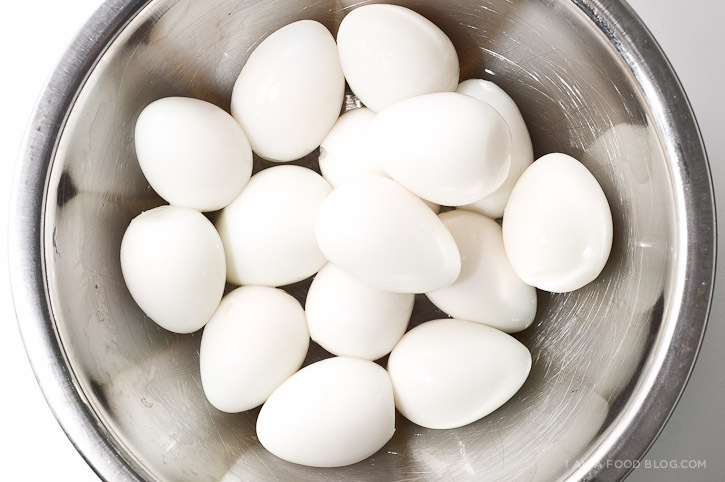 Remove the eggs from the boiling water with a slotted spoon and immediately plunge into ice cold water. Peel when cold. Place flour in a wide shallow bowl and panko in another wide shallow bowl. Divide sausage into 12 equal portions. Pat 1 portion of sausage into a thin patty over the length of your palm. Lay an egg on top of sausage and wrap sausage around egg, sealing to completely enclose. Repeat with remaining sausage and eggs. Whisk your large egg in a medium bowl to blend. Working gently with 1 sausage-wrapped egg at a time, dip eggs into flour, shaking off excess, then coat in egg wash. Roll in panko to coat. DO AHEAD: Can be made 1 day ahead. Keep refrigerated, uncovered. Attach a deep-fry thermometer to side of a heavy pot. 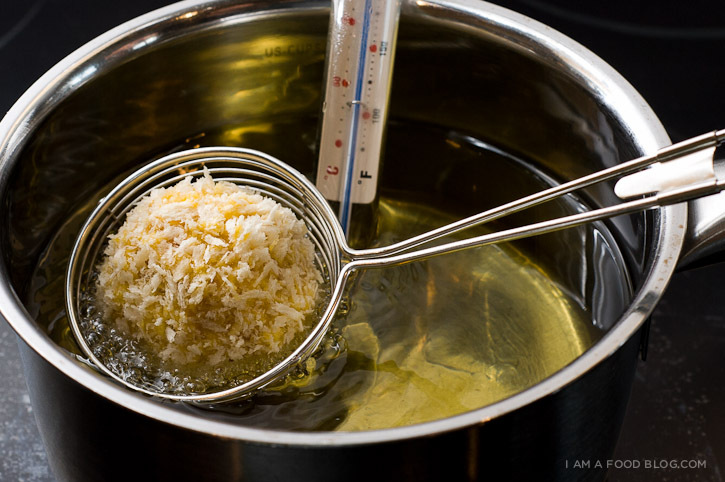 Pour in oil to a depth of 2” and heat over medium heat to 375°F. Fry eggs, turning occasionally and maintaining oil temperature of 350°F, until sausage is cooked through and breading is golden brown and crisp, 5–6 minutes. Use a slotted spoon to transfer eggs to paper towels to drain. Season lightly with salt and pepper. Serve warm with mustard. I will have to make this soon. PS. I am so glad you’re back! That looks amazing! 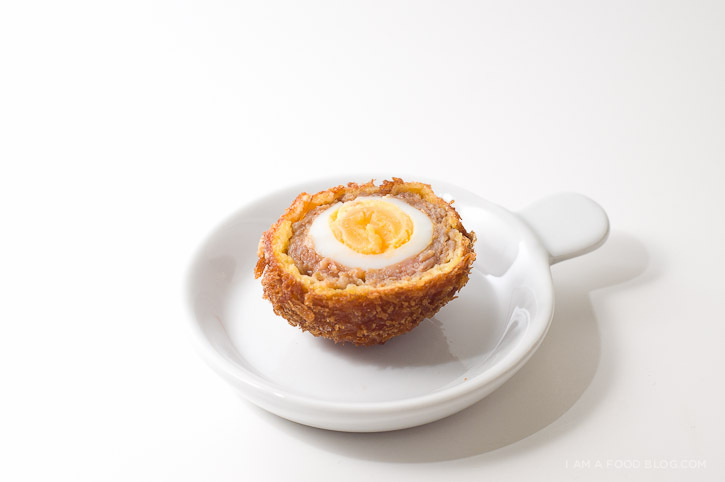 I’ve never even heard of a scotch egg before, boyfriend will like this one:)This is the first time I’ve wound up on your blog & the pics alone have my stomach growling. Lol..Not a good idea to eat the computer screen Calvin. God! this must be heavenly!!!! Absolutely beautiful blog! don’t stop doing it. How could I take a photo like you? I make these with regular soft boiled eggs and i season the panko with salt, pepper, ground cumin, chipotle, a tad of ground cardamom, and some ground corriander. Ah, yes, the scotch egg – used to be sold everywhere in the UK and loved. Sadly, it has disappeared in many of the butchers and supermarkets I frequent – not sure the delicate quail egg will fill my husband. But no worries – they will be PERFECT for me….yum yum!! Love eggs. Great recipe for Scotch eggs. 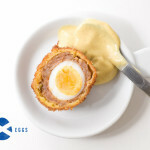 I love scotch eggs – just featured your post on my blog http://wehearthome.com/4-foods/ thanks for sharing this recipe!! This blog is WAY too popular to fit the qualifications but I love it so. This looks so interesting. I’m so glad I found a new food blog to drool over. Interesting! I think I’m hungry. This looks good! We tried another egg favourite – the omelette yesterday! We’ll have to try this though. Well, from the looks of it’s delicious. Thank you so much for sharing this recipe and I really love eggs. I am gonna try it later. Wow, this looks FANTASTIC. This might sound silly, but would it be too weird to use chicken eggs? Lol… I don’t think I can get quail eggs where we are. That’s a really interesting fact – in my ignorance I had assumed that the eggs were Scottish! I had no idea that they were invented by Fortnum and Mason, and such a long time ago too. I presume you can still buy them from Fortnum and Mason – I wonder if the recipe has changed in the last few hundred years! Wow it looks so delicious, I had never seen this type of recipe in the life, even I would like to try this. all your fonts for the description of the food is super nice. may i know what fonts are those?? this Mini Scotch Quail Egg sound very good and i thought your blog was very good, you made the egg sound delecioude an dit looks easy to make. how long would it take to make all 12? i thought you put every detel that you could in this blog, how to make it, how long, what you do. very well said too. This looks delicious and the photo is beautiful! You should try the Black Watch version of a scotch egg. You use a 50/50 mix of black pudding with the sausage meat. Nice blog. i love eggs, will definitely try this recipe soon. Thanks a lot for sharing. Please feel free to add some spices! I didn’t use any because the sausage I used was quite flavourful, but I think some extra spices would be lovely! I love how cute the scotch quail eggs are. I ended up baking my scotch eggs when I posted them last month because they fell apart in the oil. I used a combination of sausage and lamb bacon, and in a true tribute to the British dish, served them with a honey mustard aioli. The funnest part was making the stop-motion video of the process! I kinda love scotch eggs and I am right there with you on the carriage ride thing.